Strategic Coach® | Is Strategic Coach Right For You? Claim your freedom: Work less, make more money, and achieve your best results. Make the call of a lifetime! Fill out the Strategic Coach® “Right-Fit Call” application to book your one-on-one phone call with one of our Membership Advisors and immediately get access to your bonus package. Just book your Right-Fit Call, a 30-minute phone conversation with a Strategic Coach® Program specialist, and get instant access to the most current Dan Sullivan thinking and strategies. 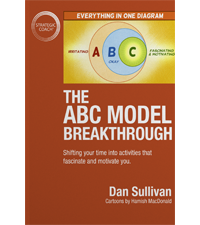 The ABC Model Breakthrough ebook gives you a simple process for shedding unwanted activities to concentrate on those activities that will always fascinate and motivate you. A behind-the-scenes video excerpt from the elite Genius X Workshop for entrepreneurs in Scottsdale, Arizona, where Dan walks participants through The ABC Model concept. 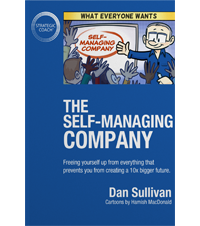 Dan’s Self-Managing Company ebook provides you with 8 crucial mindsets needed to free yourself from everything that’s preventing you from creating a much bigger future. Learning whether Strategic Coach® is the right fit for you is important to you and for us. Answer the questions below to get yourself set up for your one-on-one Right-Fit Call.